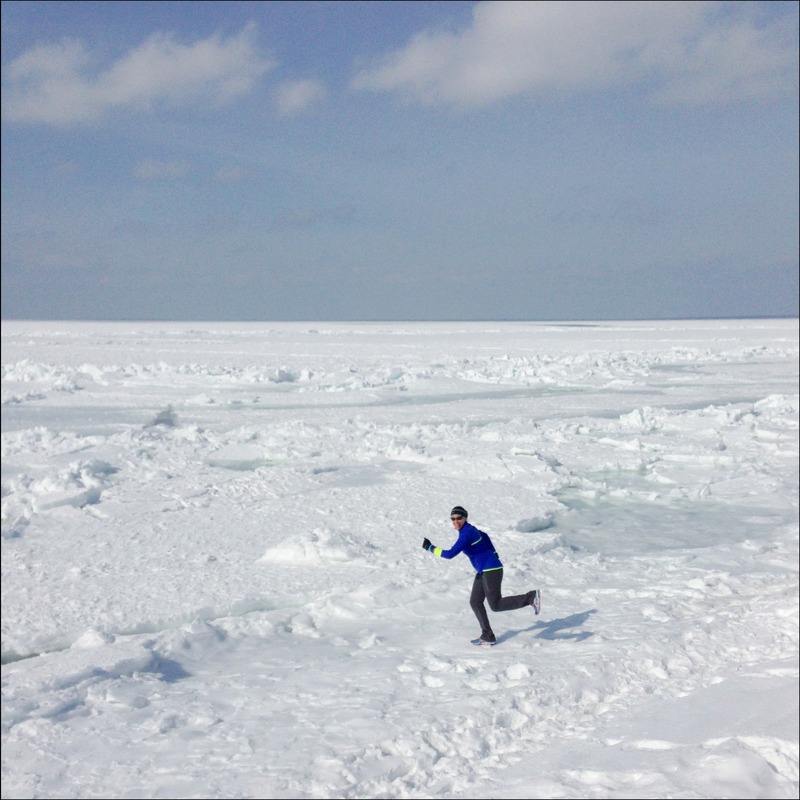 With all the snow and ice we’ve had I’ve definitely been working on making friends with the treadmill – 3 out of my 4 runs this weekend were indoors, but it was the outdoor run on Saturday that was really amazing! Jason and I met our friends Jen and Allison for a few miles and we decided to detour off the bike path (which was hard packed snow – glad we all had YakTrax!) 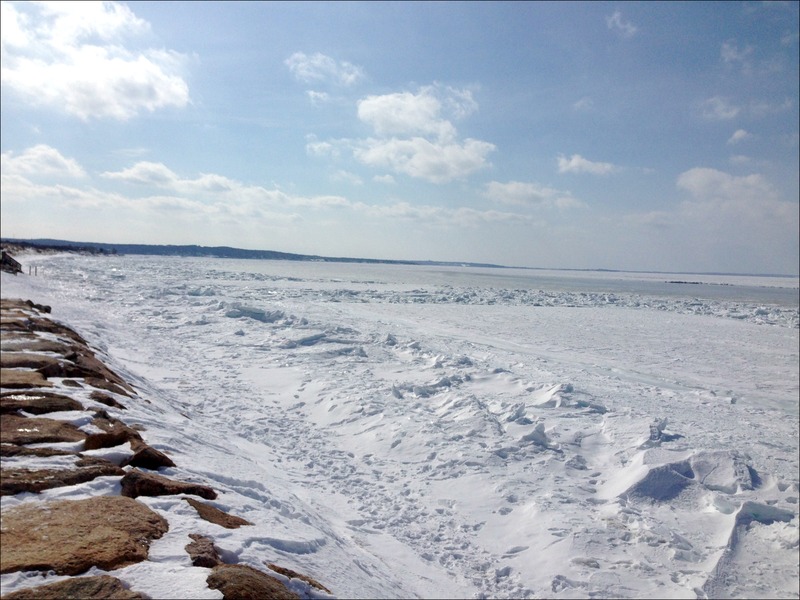 and head down towards one of the local beaches and boy am I glad we did, it was AMAZING – the bay was completely frozen! As cold as it was, it was great to be outside and get in a good run! 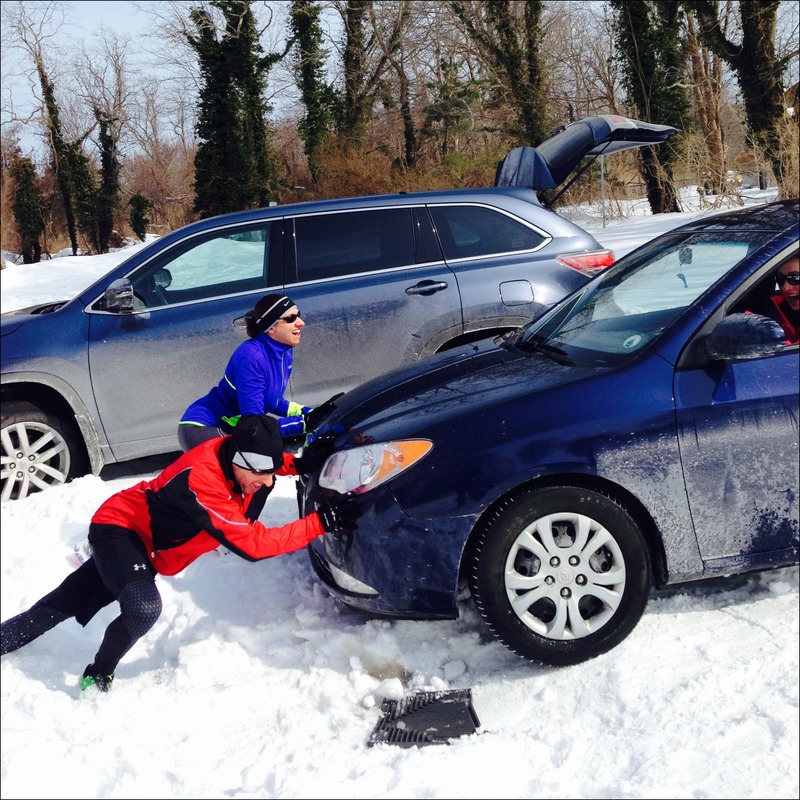 We even got in a little post run strength training when we had to get Jen’s car un-stuck in the parking lot! 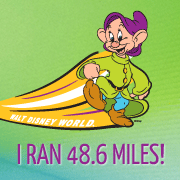 I’m really hoping to begin to up my mileage in the coming weeks, but for now (since I’m not training for anything specific) I’m sort of just going with the flow, enjoying some cross training and working my runs around the weather! 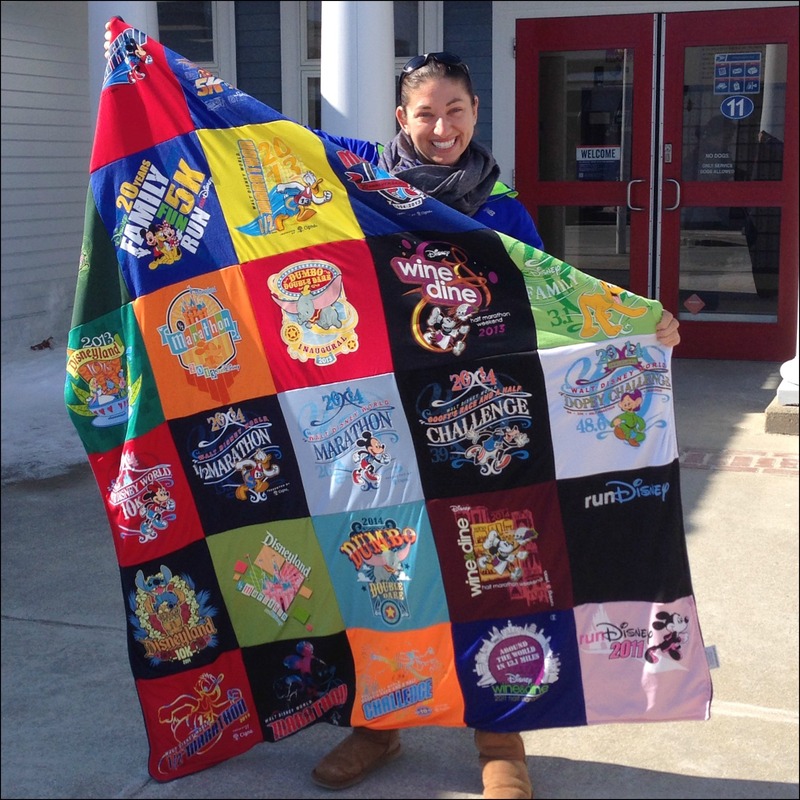 So excited my Project Repat t-shirt blanket arrived! There’s a full post on it coming this week, but I think it’s safe to say I LOVE IT! 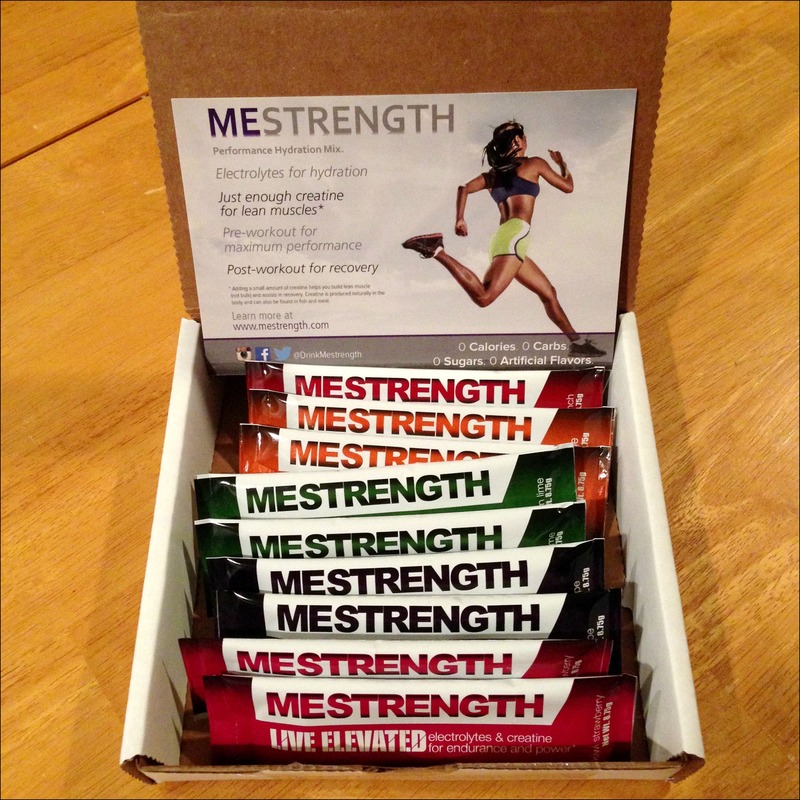 A few weeks ago I was sent a package of samples from MESTRENGTH, a performance hydration mix. MESTRENGTH is a drink mix powder that provides athletes with a balanced blend of electrolytes for complete hydration as well as 5 grams of creatine for muscle recovery (not for muscle bulk – at 5 grams creatine helps minimize lactic acid buildup, ultimately aiding in muscle recovery). 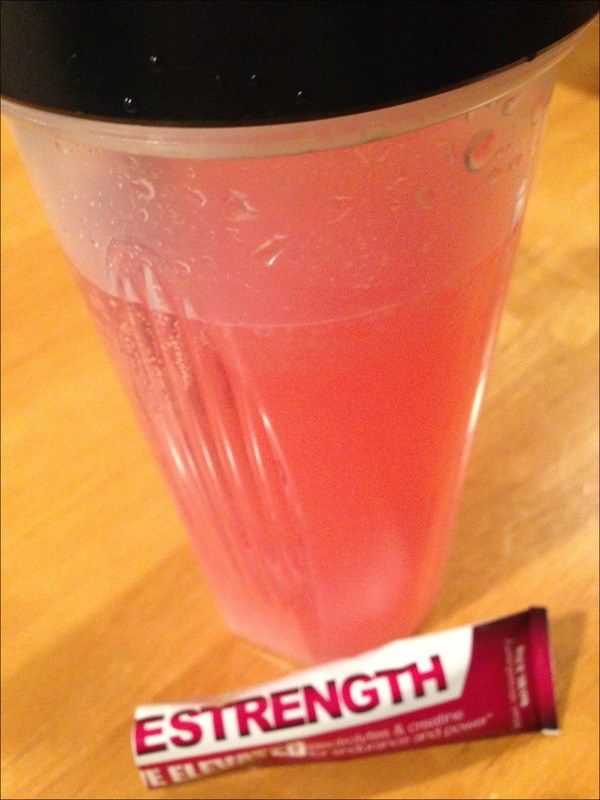 What’s truly different about MESTRENGTH products is that unlike most sports drinks, it does not contain any calories, sugar, artificial sweeteners, artificial flavors, etc. The ingredient label is simple, straightforward and to the point – plus, the product is vegan, vegetarian and gluten free. I tried most of the flavors I was sent (sorry guys, but no way I’m trying anything grape flavored! ), and I really liked them! My favorite was the kiwi-strawberry, it was a nice subtle flavor, not too overpowering and I especially like that the product is vegan/ vegetarian! MESTRENGTH is currently offering 25% off all orders if you’re interested in trying some! Use code “BIBRVE25” at THIS LINK. Disclaimer: I was sent this complimentary sample of MESTRENGTH as a BibRave ambassador. All thoughts are my own. Good idea about the blanket! I know what it is having tee shirts you’ll never wear. Looks great! Saturday still makes me chuckle. What a morning!